The Federal Open Market Committee (FOMC) convenes for the first time in 2016 on Tuesday and Wednesday amid the worst start to the year ever for the equity markets. 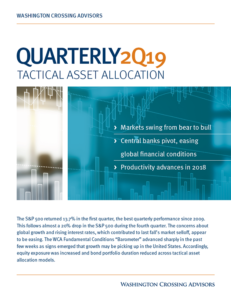 Market uncertainty and low oil prices have tempered expectations for how quickly the Federal Reserve (Fed) will raise interest rates this year. Unlike the previous FOMC meeting in December 2015, Janet Yellen will not hold a press conference at the conclusion of this meeting. The earnings season is underway and expectations are for a 6% decline in earnings, which would mark the third consecutive quarter of earnings declines. The S&P 500 now trades at 14.9 times forecast earnings. Inflation across the world is exceptionally weak, partly reflecting weak commodity prices. Still, the Bank of Japan (BOJ) and the European Central Bank (ECB) are confronted with near 0% year-over-year changes in headline inflation. Last week, Mario Draghi indicated the ECB is willing to deploy additional measures within the ECB’s mandate to combat weak prices and slow growth. Meanwhile, pressure is increasing at the Bank of Japan to step up monetary stimulus given continued failure to generate the 2% inflation target they seek. Until now, much of the inflation story was centered around weak oil prices. Most central banks try to exclude the effects of volatile components of price indices when setting policy. Our own Fed has several inflation measures they follow that adjust for the impact of outlier price swings. One of those measures is the Dallas Fed Trimmed Mean Personal Consumption Expenditure Inflation Index (try to say that one three times fast!). This indicator shows that prices are up 1.7% over the past year and have been generally edging higher since 2013. If this indicator is right, then the plunge in global headline inflation should turn out to be temporary and will reverse once commodity prices find a bottom. Alternatively, the Core Personal Consumption Expenditure measure of inflation, again stripping out volatile energy prices, is registering a 1.3%. There simply is not much inflation picked up in the official inflation statistics. With that as a background, the Fed gets set to meet on rates again this week. No change of rate is expected and there will be no press conference or forecast release. Markets will have to settle for parsing the official statement this week. The next time the Fed meets will be March 15-16. This meeting will be associated with a press conference by Chair Janet Yellen and an update of the Federal Open Market Committee’s economic projections. This will happen five days after the European Central Bank meets and one day after the Bank of Japan meets. In other words, the series of central bank meetings in March are the next focal point for investors looking for guidance from these three major central banks. Mark your calendar! In terms of macroeconomic trends, we continue to see relatively weak readings in our WCA Fundamental Conditions Index (below). The last two bars on the chart are projections based on our model. We are suspect of the model’s forecast, however, since most of the economic data from January is not yet in. There is little we’ve seen lately that gives us especially strong indications that a turn is at hand. 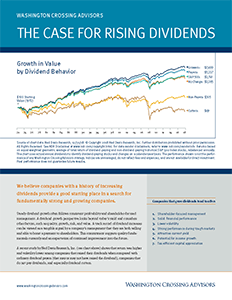 Although there is no simple formula, model, or approach that will allow anyone to precisely forecast markets, we believe that in the long run, markets tend to converge to a “fair value” determined by logical economic relationships. In the short to medium term, however, other factors including a broad range of human behaviors shape the path to longer-run equilibrium. One of the most basic economic relationships is that of economic growth and market performance. 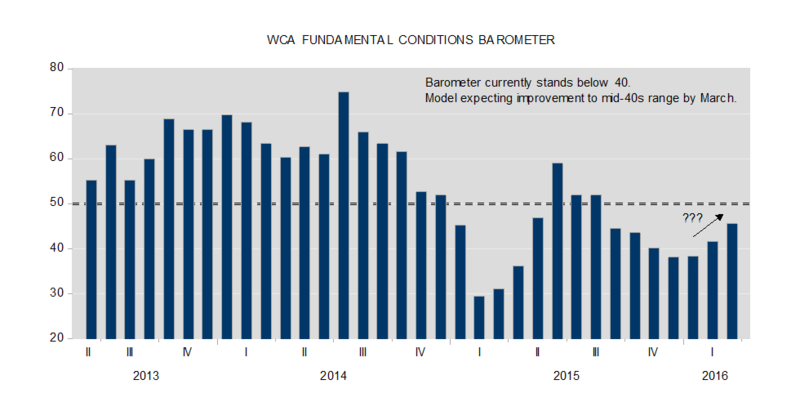 The WCA Fundamental Conditions Barometer is one tool that we use in evaluating changes in economic conditions. Earnings are beginning to come in for the fourth quarter earnings season. Earnings are expected to decline 6% in the quarter from a year ago. This would mark the third consecutive quarter of declining earnings if forecasts are realized. A stronger dollar, lower oil and gas prices, slowing global growth, and increased wage pressure are all the latest reasons offered for the weakening earnings picture. Based on Friday’s close, FactSet estimates the S&P 500 is trading with a forward P/E ratio of 14.9x expected earnings of $125.50. This is 5% above the 10-year average forward multiple of 14.2x. By this measure, we can say the market is better valued than it was at the start of the year when it traded at 16.3x forward earnings, but it is far from cheap. Similarly, we note that net profit margins are beginning to come down and stand near 9.8% compared to a 8.8% 10-year average also (11% above average).